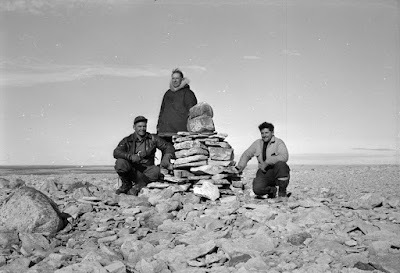 Even before he arrived on the shores of King William, he’d already been awarded the Gold Medal of the Royal Geographical Society, for being the first man to traverse the Northwest Passage from West to East, in command of the RCMP vessel St. Roch – a feat he repeated in the opposite direction a few years later. His name was Henry Asbjørn Larsen, and no other searcher before him came closer to standing in Franklin’s own metaphorical shoes. Larsen’s experience had been gained on numerous northern patrols over two decades; he eventually rose to the rank of Inspector, in charge of all RCMP detachments in the Canadian Arctic. Both the breadth of his experience and his keen eye for detail served him well; despite poor weather conditions and limited time, his search of the area between Cape Felix and Victory Point produced what may be some of the most significant finds since those of Schwatka. Larsen’s search took place in the summer of 1949, just before his promotion to commanding officer of the force’s “G” division. He took two RCMP men with him, Corporal Seaforth Burton and Constable John Biench. He’d hoped to squeeze in the mission between his other duties, but news of his trip was inadvertently leaked to the press; as a cover story, an announcement was made that the trip was merely to scout a location for a new RCMP post. Larsen’s pilot, Harry Heacock, flew them over Lind Island and Victoria Strait; despite poor conditions, he was able to land briefly to establish a fuel depot at Terror Bay. Returning the following day, they were able to land and establish a base camp near Collinson Inlet. From there, they proceeded on foot, working their way up the coast to Cape Felix. At Cape Lady Jane Franklin, they found wood-chips and part of a shoe sole; joined there by Bill Cashin (who’d served as Larsen’s mechanic aboard the St. Roch), they began a close search of the area around Victory Point. Here they had better luck, turning up two iron knees (almost certainly from a ship’s boat of the kind used by Franklin’s men), along with other small fragments of wood, nails, and wire. 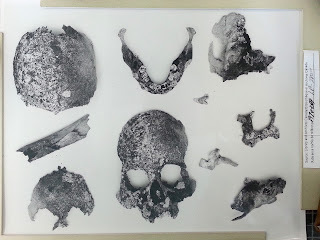 Continuing to Cape Felix, they made their most significant find: embedded between two mossy stones, they came upon a human skull. On their return, the artifacts were brought back to the National Museum (the precursor institution to both the Canadian Museum of Nature and the Canadian Museum of History). 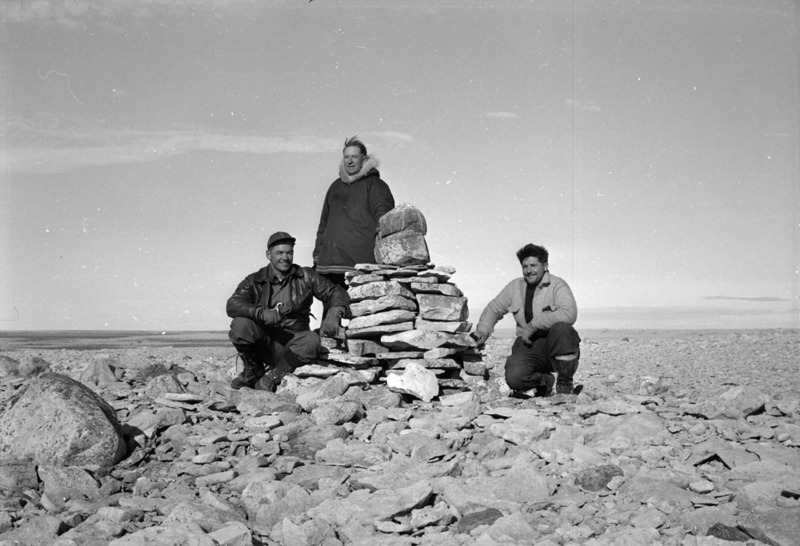 There, the bones were examined by Dr. Douglas Leechman, one of Canada’s pre-eminent archaeologists, who identified them as “definitely that of a white man, and a fairly young one at that.” Larsen and his companions had found the most northerly grave of one of Franklin’s men on King William Island. Yet, as with earlier searches, the vital documentary evidence of this discovery has been misplaced and scattered. Larsen’s report, if indeed he submitted one, has gone missing, although R.J. Cyriax’s article about the search in the Geographical Journal was clearly based on some sort of fairly detailed communication from Larsen. Cyriax thought very highly of Larsen’s account, declaring it “much more detailed and precise than any of the published accounts with which the [present] writer is acquainted.” No trace of the report is known, and the artifacts themselves appear to have been misplaced; the curators that I’ve contacted to date have no record of them, and they were never entered into the archaeological databases of either the Northwest Territories or Nunavut. Had it not been for the assistance of Doreen Larsen Riedel, Larsen’s daughter, I might never have learned the details of their discovery. They were, fortunately, photographed, and the images deposited in the National Library of Canada; spread out on of white surface, these mossy bones glimmer with an eerie presence, frozen in the camera’s eye even though they, too, have since vanished from our sight. Several years ago, while doing research for my article, "An Arctic Execution," I was treated to a behind the scenes tour of the Smithsonian Institution. The sheer volume of material museums have in their holdings unfortunately sometimes results in items going missing. In addition, over many years, methods of cataloguing change, and this contributes to the problem. Other reasons for items going missing are rather more...sinister. Thanks for your comment, Glenn. It's true -- and in the case of the Larsen relics, they were given to the old "National Museum," which has since been split up into two major entities (the old Museum of Civilization -- now "Museum of History" -- and the Museum of Nature), at which point no one is quite sure where they went. Another case in point would be the original Magic Lantern slides used by William Bradford in his "Arctic Regions" recitals in the 1880's. They were discovered at the New Bedford Whaling Museum -- where, in fact, they'd been for many decades. The curator had simply neglected to create an accession record. Larson's little ship the St. Roch, currently resides at the Vancouver Maritime Museum. I had the chance to stand on it and it's a humbling experience. I encourage all to visit if they can. I thank you Russell for sharing your expertise on this site! Interesting story, thanks for posting this. The picture of the skull staring out is a striking symbol of the whole expedition. As a former museum curator, it always amazed me what turned up in the store room. Things such as carpenter's marking gauge catalogued as children's toys! No wonder it was never found under its real name. Or items with no provenance. (Probably put there in a "to do" pile over 50 yrs ago and never dealt with). Or my personal favourite were the tags from the 1920's which read "on loan" but no indication from whom! So it's no wonder Larsen's items are "missing" but not necessarily "lost". So fascinating , to learn all this ! I purchase a copy of the book about Henry A. Larsen,"The Big Ship". During the 1944 voyage across the Northwest Passage from east to west, the St. Roch stopped at Dealy Island. Stuff from the 1850s were still there. On page187, Larsen states: " We picked out a few tins of 'Ox Cheek Soup' made in 1850 by a manufacturer located opposite East India House in London. They bore the following directions for opening: ' Take a hammer and chisel and cut out one end while being careful not to let flakes of the paint which cover the cans get into the soup.' We also selected some cans which seemed to contained preserved carrots and some marked as 'Normndie Pippins,' whatever they were.When we opened one we found that it was in the form of small dried apples. These items all were turned over to our Headquarters for analysis when we returned outside." Thanks for this -- fascinating details!